PUBG LITE, Free Angry Teddy Costume For April Fools Day - KABALYERO - PLAY, BLOG & EARN! April 1 means it's another April Fool's Day where everyone and anyone can play practical jokes and even spread hoaxes but, in PUBG LITE, you will get an Angry Teddy Costume instead. The Angry Teddy Costume is basically a big nasty looking worn down Teddy Bear costume. It's free but it will only last for a few days and, after that, it will vanish into nothingness just like all time limited items. Getting the Angry Teddy Costume is super easy and simple. All you have to do is login to your PUBG LITE game account and claim the Angry Teddy Costume. Claiming the Angry Teddy Costume will add it to your Wardrobe under the Customize tab. To wear the Angry Teddy Costume, just go to your Wardrobe under the Customize tab, find the Angry Teddy Mask and the Angry Teddy Suit and double click on each item to wear them. You can also click on the Equip button after selecting the items to wear them. The Angry Teddy Costume is simply just a cosmetic item that will change your character's appearance when worn. It will not help you in playing the game nor will it give you any kind of advantage. Actually, wearing the Angry Teddy Costume might even give you a disadvantage because it will make your character a little bit thicker or fatter or wider and easier to spot in the game. Anyway, having something different to wear in the game from time to time can make the game a little bit more enjoyable and less boring when played. 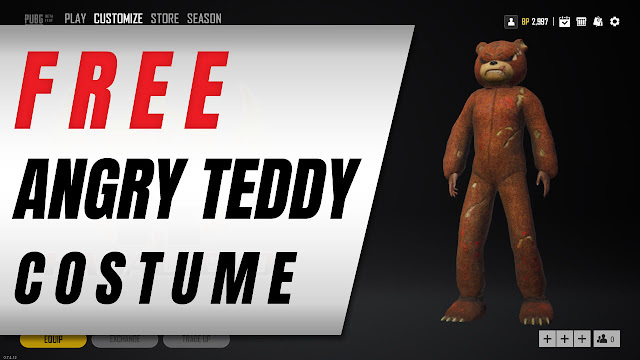 So guys, have you claimed your free Angry Teddy Costume in PUBG LITE? Post your answers as well as your comments, questions or reactions in the comments section below.